Clos Martinet is owned by José Luis Perez who runs the estate with his very talented daughter, Sara. Besides being a qualified oenologist, Sara has studied in philosophy at Barcelona university. Sara and Jose Luis consult for a number of other producers and are also behind recently established Cims de Porrera project. 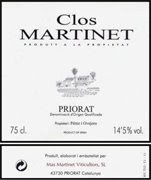 Clos Martinet makes about 3000 cases from approximately 10 hectares of vineyards. Half is labelled as Clos Martinet and half as Martinet Bru, the well priced second wine. About 7 hectares are located close to the Siurana river on the road from Falset to Gratallops. The remainder are elsewhere in the Priorat appellation, mostly near Porrera, the origin of the old vines, Carignan and Grenache. The wines, about 45 % Grenache, 20 % Cabernet Sauvignon, 20 % Merlot, 5 % Syrah, 10 % Carignan, rank with the very best of Priorat. They produce rich and intense wines with a classic spicy, peppery bouquet and enormous power, depth and length. The Clos Martinet is aged in 100% new medium toast French oak. These are gorgeous, complex juicy wines of immense appeal. The Martinet Bru is also aged in French oak and is just a little less complex than the Clos. This wine is very approachable young and represents an outstanding value. This dark and deeply colored Priorat is chalk full of flavor and unique Spanish flair. On the nose I get black plum notes combined with aromas of spice, saddle leather, grilled game meat, black currant, tobacco, burnt earth, and unsweetened cacao. On the palate the wine is densely compact with black fruits but has a streamlined soft texture that isn't too thick. Flavors of black plum, blackberry, dried flowers and herbs, black cherry, and dark chocolate. There is good acid here and the wine and the pure black fruit finish lasts for at least a minute or two. I will agree with ol' Robbie Parker Jr. and score it 92 points.